Zakaat . Allah commands Muslims to help those who have not.“And those in whose wealth is a recognized right” (Al Ma’arege 24-25). Zakaat purifies people’s wealth and cleanses the individual s’ sins and helps them overcome their greed, and many other spiritual and physical diseases. the Zakah-payable amount of gold is 85 g. of pure gold. Thus, whoever possesses such an amount of gold, i.e., 85 g, has to pay Zakah that amounts to 2.5% of the total value of the gold provided that one lunar year has passed. Zakah on 401K Account: The basic rule of Zakah is that it is due on the wealth that one owns and has the freedom to use, therefore (according to some scholars): A: The employee’s contribution to this fund is Zakatable if it is done by his/her own choice. B: There is no Zakah due on these funds if they are collected compulsorily by the employers due to the company or government’s policies. Zakah will be due on these funds when they can be withdrawn. C: There is no Zakah due on the company’s matching contributions until they can be withdrawn. D: When these funds can be withdrawn, then if they reach the value of nisab and a year passes on them, then the Zakah (at the ration of 2.5 per cent) will be due. E: The Zakah must be paid for the money that one receives and then voluntarily contributes to a retirement fund (such as IRA etc. ), if it reaches the nisab and after a period of one year. Zakkat Al-Fitr (Fasting): It is equivalent, to approximately, seven pounds of (your choice): rice, or dates, or barley, or raisins and it must be paid before Eid Prayer. Kffarah or Expiation for the amount for missing a fast (older / chronically sick person and… who cannot fast): the Kaffarah is equivalent to, approximately, three pounds and half of (your choice): rice, or dates, or barley, or raisins, an amount to pay per every missed day. Zakaatul-maal Literally, Zakaat means, Blessing, purification, increase and goodness. The soul of one who gives Zakaat is blessed and so is his/er wealth. 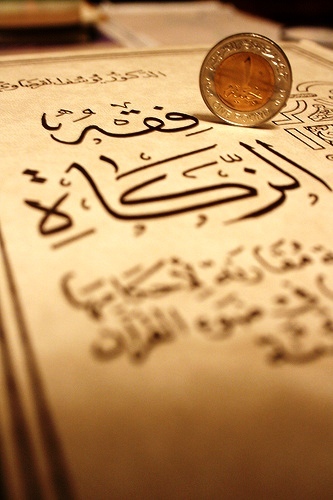 Technically Zakaat is defined as: “A determined portion taken from wealth and allocated to those deserving it, by a Qur’aanic injunction.” Zakaat is the third of the Five Pillars of Islam. Denying it leads to disbelief Muslims should also pay their Zakaat (2. 1/2%) of their possessions (money or goods for sell) for a period of one lunar year. Zakaatul-FITR Muslims are urged to be always charitable, but in Ramadhan they are urged to be more so. The Prophet Muhammad used to give away much more during Ramadhan. However, a special mandatory Zakaat that must be paid during the month Ramadhan or on the early morning of Eidul-Fitr is “Zakaatul Fitr”. It is estimated to be approximately $8.00 per Person, the cost of food sufficient for an ordinary adult person for one day. It is to be paid on behalf of the person, the Spouse, all children including an infant born in Ramadhan, and others like home-helpers and parents who are supported financially by their children.